Recording tail biting is a vital tool to help identify the likely causes of tail biting. "5. The procedure may only be carried out where measures to improve environmental conditions or management systems have first been taken to prevent tail-biting, but there is still evidence to show that injury to pigs’ tails by biting has occurred. It is required that pig owners/keepers should document evidence of tail biting and keep records of the measures instigated and their effectiveness on improving the pigs’ welfare. Where records are not available and pigs are found to be tail docked, this may be considered in any decisions regarding the legality of the tail docking procedure being carried out by owners/keepers or any staff. " It is required that pig owners/keepers should document evidence of tail biting and keep records of the measures instigated and their effectiveness on improving the pigs’ welfare. Where records are not available and pigs are found to be tail docked, this may be considered in any decisions regarding the legality of the tail docking procedure being carried out by owners/keepers or any staff. How widespread is the problem – does it affect a particular building, pen or found across the farm? Is there a predictable time/age group for the problem? Is there a predictable building for the problem? Is there a predictable pen or pens for the problem? Is one source of pigs more at risk than another? Is one source of genetics more at risk than another? Without records it is difficult to show whether a recent change on the unit is responsible for a change in tail-biting behavior, or whether the change is a coincidence. Records could be completed per building, or per unit. Currently, there are two recording sheets available for download from the WebHAT. They enable producers to demonstrate actions taken to avoid tail biting as well as early warning signs. What to do with tail-biting records? Keeping records regularly can help to show whether or not there is a pattern to any tail biting occurrences. For example, comparing records with the matching time of year (eg totals per quarter or month) can help identify whether there are seasonal patterns. They can also be used to highlight the emergence of tail biting-behaviour at a specific age, timing after moving to different accommodation/groups - identifying issues in management to address. The source of pigs → check with the producer/supplier whether other units have similar issues. If all units receiving pigs from this source have a tail biting issue, the producer should check for recent changes to address on the source unit. If occasional tail biting occurs in different pens across the farm, this can also highlight that something such as ventilation, temperature, feed supply, nutrition etc is not quite right across the farm site. 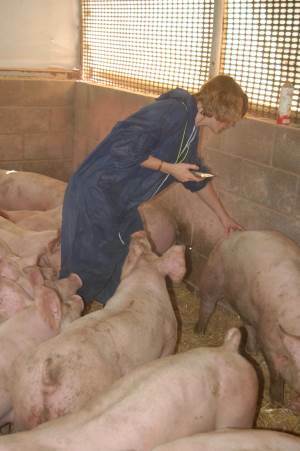 The majority of pigs may be able to tolerate the situation, but it is an early sign that individuals in some pens may turn to tail biting, indicating that the conditions are stressful for some pigs. A deterioration in the situation, eg temperature gets hotter (or colder) or another factor occurs (such as feed outage) may tip the rest of the pigs into tail biting. The earlier the risk factors can be identified and dealt with, the fewer pigs are likely to be involved in tail biting – either as biters or as bitten pigs.